Find more stories I reported for OPB here. Rent control is complicated and it takes different forms. But the basic idea is that it protects tenants by imposing limits on what landlords can charge. So why does the state of Oregon have a ban on rent control in the first place? What started as a community protest in support of a pair of local ranchers, father and son Dwight and Steven Hammond, ended with an Internet live stream of a 27-year-old Ohioan contemplating suicide — and finally surrendering. One man died, and 25 other people are charged with crimes related to the occupation. But how did we get here? In the days after the occupation, OPB put together an hour long documentary that pulls on some of the station's best reporting to unpack what happened. 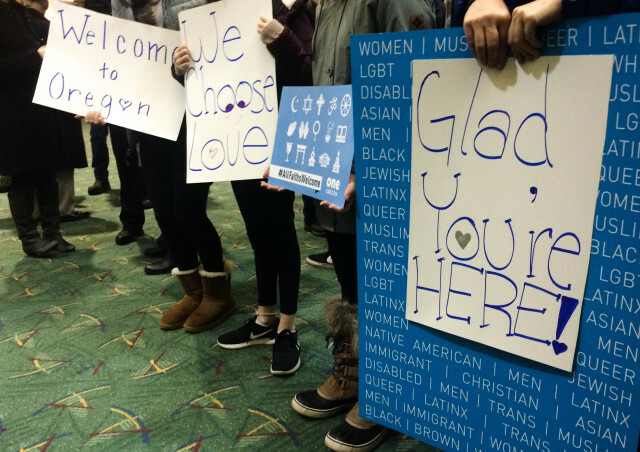 In February, an Iraqi family of five landed at the Portland International Airport. According to the ACLU, they’re the first refugees to arrive in Oregon since Jan. 27, when President Trump issued his controversial travel ban. A crowd of people toting signs, stuffed animals and balloons were there to welcome the family to the Rose City.